Restore your look with Bellafill, the longest lasting filler made with unique microspheres that are not absorbed by your body and provide collagen stimulation for natural, long lasting results. MENTION THIS PAGE AND RECEIVE 20% OFF YOUR FIRST PROCEDURE! It is the longest lasting filler made with unique microspheres that are not absorbed by your body and provide collagen stimulation for natural, long lasting results. It is used to add volume and smooth away facial wrinkles and folds. The treatment improves over the course of several months and stands the test of time. I like using it because I have reliable and lasting results with it. You can be sure you are using the best. Suneva Medical awarded Margaret L. Larson, MSN, ARNP, FNP-C the Top National Bellafill Injector and BellaDiamond Elite Status since 2014. This award is specific to the Bellafill product. Experience counts when it comes to facial aesthetics and you are using the most experienced injector in the area. Bellafill® offers a new level of filler rejuvenation. 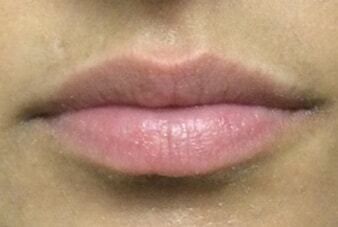 Patients have spoken and said 5 years of no smiles lines is oh so worth it. 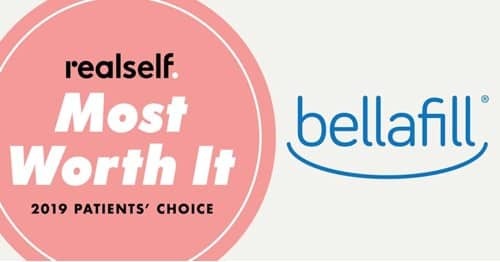 Bellafill was just named a 2019 Most Worth It procedure by RealSelf! Bellafill®, formerly known as Artefill®, is the revolutionary result of when true science meets the field of aesthetic medicine. Bellafill® is like other dermal fillers, but far more advanced. Comprised of microspheres, Bellafill® can be described as similar to an implant because it is not absorbed by the body. Bellafill® is FDA approved for treatment of nasolabial folds and for correction of acne scars. 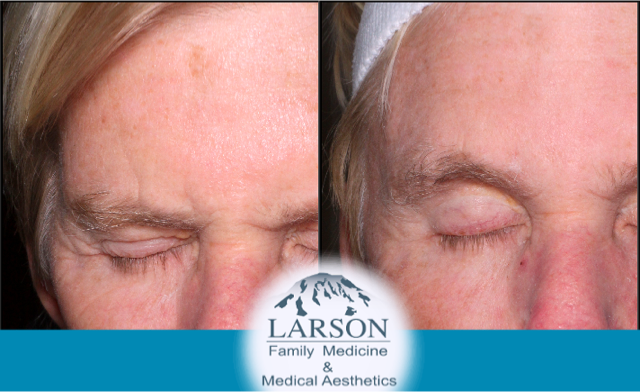 Margaret L. Larson, ARNP, is very skilled with Bellafill, and has also used Bellafill® in Seattle and Bellevue to create the full “liquid facelift”, treatment for under-eye bags, nose correction (nonsurgical nosejob), lip enhancement, hand rejuvenation, brow lift, and other custom designed procedures. At the 5 year mark, the clinical study found that 90% of patients treated with Bellafill® in were “very satisfied” or “satisfied” with their treatments. The 10-year study has not been concluded yet, so officially the manufacturer of Bellafill®, Suneva Medical, hasn’t made claim to the 10-year mark. How much Bellafill® do I need? Similar to treatments at a plastic surgeon’s office, every face is different and will require a different number of syringes to achieve the aesthetic goal. Because Bellafill® lasts for so long, you can do little at a time to get to the look you want because it will build on itself like scaffolding – unlike with temporary filler that will be metabolized by the time a second treatment is administered. What is the cost of Bellafill®? 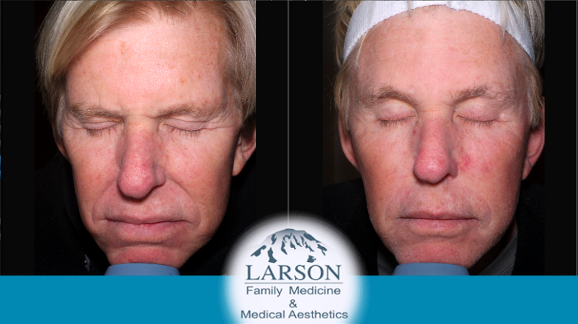 At Larson Family Medicine & Medical Aesthetics the regular price for Bellafill® is $1000 a syringe. 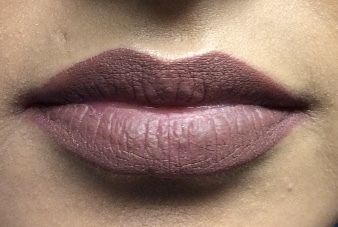 Although it costs a little bit more than temporary filler, it will last for a very long time. We consider temporary fillers as a great opportunity to try fillers for the first time but encourage our patients to invest in Bellafill® as a long term solution to avoid injection fatique. Repeated re-injection will not only do damage to the tissue but will cost much more over time than a one-time treatment from our Seattle and Belleuve Bellafill specialists. 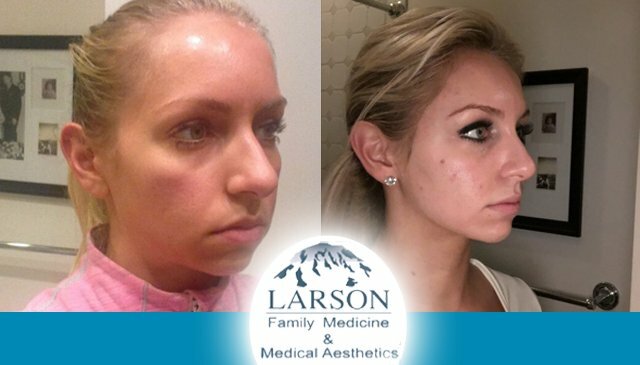 Specials and packages are available often at Larson Medical Aesthetics and are best found on Facebook or you can email info@larsonmedicalaesthetics.com to request to be added to the email list. Swelling, some bruising, redness and tenderness is normal after any injection procedure. Every body responds differently. The slight swelling will typically go down after a couple days, but some experience that it will take up to two weeks for the swelling to completely dissipate. After treatment you’ll have instant results! As soon as the microspheres are injected, they’re in! How many syringes does one need when doing Bellafill? All patients are different when being treated with Bellafill, depending on age, loss of volume and areas of concern treatments with a Seattle or Bellevue Bellafill specialists can be anywhere from 2 to 20 syringes, that doesn’t mean all 20 syringes at one time, but can be done over a period of time depending on need. Bellafill is the longest lasting filler on the market and results get better with time as it helps your body’s collagen production. The collagen immediately adds volume to smooth away facial wrinkles known as smile lines, and the polymethylmethacrylate (PMMA) microspheres help your skin re-create its own firmer structure for beautiful, younger-looking skin and lasting results. It is a unique, injectable collagen filler with microspheres that can instantly smooth facial wrinkles (nasolabial folds) for beautiful, natural-looking correction that lasts. This means that you can expect to see results immediately and they will improve as time goes on. As of 2016 Margaret is the only provider in Washington state to receive the prestigious award of BellaDiamond Elite and remains the number 1 Bellafill Injector in North America. She has completed more than 10,000 Bellafill procedures with a 98 percent satisfaction rate. Margaret is the expert injector and facial aesthetic artist you want to meet your facial aesthetic needs. They are the best! The most friendliest caring gentle understanding clinic I know. I will never ever go any where else. I would and will refer friends and family to them. There isn’t enough words to say about these ladies. They make you feel like your at home and never make you feel nervous. Strong faith as well. I adore Larson Aesthetics…I never feel anything other than supported by the staff there and Margaret is just awesome. In terms of injection procedures Margaret Larson possesses both great technique and aesthetic sensibility. I trust that every time I have an appointment, when I leave, I will walk out with an improved appearance. I have been very happy with her work. From the staff to the doctor, my experience was warm, friendly, and attentive. They answered all of my questions. The doctor knew exactly what would give me the best results. Very impressed! Would highly recommend.